Who Sits On Santa’s Lap Anymore? 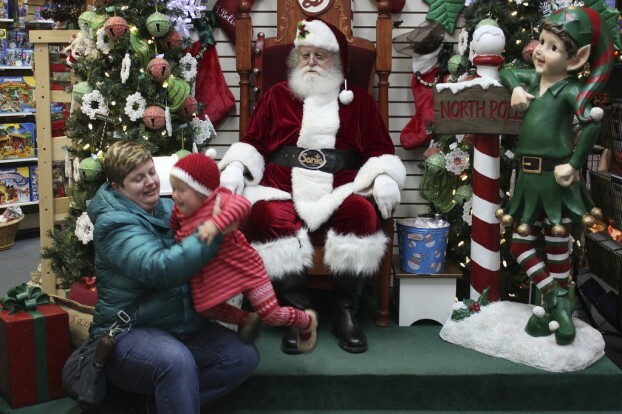 Mall Santa’s have been a fixture of the holiday season for generations. Every year, children line up to sit on Santa’s lap and tell him what they want for Christmas. In many cases, someone — usually an “elf” — is even on hand to take a picture as a souvenir. The kids might get a cookie or a candy cane, and they go home secure in the knowledge that Santa Claus knows what presents they want to unwrap on Christmas day. It’s always a lot of fun, and for many kids, Christmas doesn’t feel like Christmas without a conversation with Santa Claus. That’s how things used to be, anyway. These days, it seems like fewer children are sitting on Santa’s lap at the mall. In some cases, the problem lies with young children screaming in fear at the prospect of being placed on a stranger’s lap. In other cases, it’s Santa Claus himself who is wary of having kids on his lap. This holiday tradition is far from dead, but could it be dying? And if it is, why? One unfortunate reason why children might not sit on Santa’s lap is because they legally might not be allowed to. In 2011, volunteer parents who went to schools in Great Britain dressed as Santa Claus were told in no uncertain terms that they are not allowed to have any physical contact with children. Naturally, this meant that children weren’t allowed to sit on Santa’s lap. This trend didn’t stop at British schools, either. Mall Santas throughout the United Kingdom and the United States often end up having to sit next to children while they are told what to give them for Christmas. Concerned parents and other official organizations are trying to protect children from inappropriate contact with strangers. That makes sense, especially since many school officials aren’t allowed to have much contact with children for the same reason. Whether or not banning kids from sitting on Santa’s lap is an extreme reaction to the threat of sexual assault is debatable. After all, there are always other adults present at mall Santa displays, so there is plenty of supervision. Then again, it is important to have very firm boundaries that should never be crossed. As we mentioned before, some children — especially young kids — may simply be too afraid to want to sit on Santa’s lap. There seems to be a trend on Facebook and Twitter of people posting “funny” pictures of screaming children sitting on Santa’s lap. Naturally, not everyone thinks these pictures are funny. These children are obviously very afraid, and they’re being forced to do something they clearly don’t want to do for the sake of tradition and a photo opportunity. Many parents are deciding to avoid inflicting possible trauma on their children, which has led to fewer kids sitting on Santa’s lap. As much as things are changing, the tradition of taking children to see Santa Claus probably won’t end anytime soon. There may be fewer mall Santa’s and fewer children who want to see them, but for now, Santa remains a fixture of the holiday season. Roger Spielmann writes on a variety of cool and fun topics. If you’re going to try to look like the real santa claus next Christmas, buycostumes.com has convincing Santa costumes which can help you out. Image credit goes to LizMarie_AK. Previous story Does Hiring A Child Support Lawyers Make “Cents”?